Jake Wayne has written professionally for more than 12 years, including assignments in business writing, national magazines and book-length projects. He has a psychology degree from the University of Oregon and black belts in three martial arts. Although both are fight sports, boxing and mixed martial arts use different rules and conventions. This affects not only how the athletes compete, but also the design of the equipment they wear. This is most evident in the gloves fighters of both styles wear, with each designed for the particulars of its sport. One of the most marked differences between the two kinds of gloves is the treatment of the fighter's fingers. Boxing gloves go on like mittens, wrapping all the fingers in a single padded compartment. Mixed martial arts gloves separate the fingers like regular gloves and leave the final knuckles and fingertips exposed. This difference comes from the fact that MMA fighters need to be able to use their hands unencumbered during the grappling action of a match. Another easily spotted difference between boxing gloves and MMA gloves is the amount of padding. 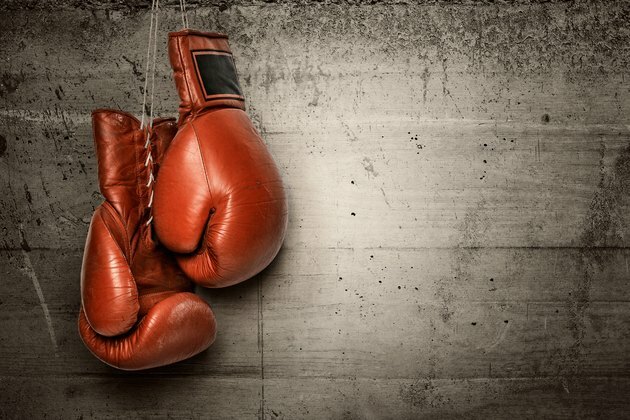 Boxing gloves are heavily padded -- often with a pound of soft material. MMA gloves are sleeker, thinner and less padded. In boxing competition, a fighter delivers and receives hundreds of punches. Most of these punches go to the head. MMA competition includes punching, but also kicks and grappling holds. Though a great deal of punches can be thrown during an MMA match, the gloves are designed to accommodate grappling, kicking and submission maneuvers as well. Traditional boxing gloves wrap around as much as half a fighter's forearms and are held in place by laces similar to those on your shoes. Mixed martial arts gloves rarely cover more than the top of the wrist and are held closed with a wrapping strap and Velcro tabs. Modern boxing gloves are also available with the strap-and-Velcro closure, a style used more often in training than in competition. Boxers wear wraps around their hands and wrists to protect the wrists, knuckles and forearms from the impact of hundreds of punches. Boxing gloves are sized to accommodate this extra load. Hand wraps are less common in MMA; the glove is noticeably more compact with little room between the hand and the glove itself. What Is the Difference Between Boxing Shoes & Wrestling Shoes?